Heinrich’s debut turns on dread but opens with light and air. 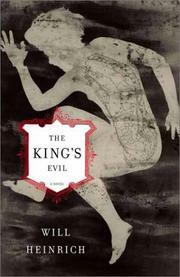 Joseph S. Malderoyce (“king’s evil”), at 17, has spent four years thinking himself a painter. But visits to a Mondrian exhibit at the Museum of Modern Art dissuade him from pursuing a future in art. He becomes instead, like his father, a lawyer, with a dried-up life of friendless study and work stretching ahead. Twenty years later, Father and Mother both die of TB within hours of each other, leaving Joseph wealthy. Not yet middle-aged, he retires, moves out to tiny Bettley (despite the MOMA, in some imaginary country), buys a house, and becomes a country gentleman, making only two friends but nonetheless gaining a sense of release on his morning walks. One stormy night, twisted but charismatic young Abel Rufous (“reddish,” as in TB), a tremendously bruised runaway, his face old, his body young, falls asleep on Joseph’s back porch after having broken into Bettley’s one store, drunk some wine, eaten some bread, and peed inside on the door. (Add a reddish-brown shade, as in dried blood, to your sense of Mondrian’s color balances.) Joseph writes that “he did not seem to me to be asleep. Because I had dreams of violent motion and color, I had always conceived of sleep as being dynamic, but this sleeping boy was frozen.” He looks wan but hints of darkness. Is Abel some coughed-up chunk of Joseph (who, since his parents’ deaths, has developed an obsession with mycobacteriology), a shadow-being long suppressed in his character, and indeed never suspected? Joseph finds himself in love with intelligent but boorish Abel, and after a month he loves having him in his house. Poisonous, loveably bright Abel, a child once beaten and abandoned, now a charmingly insufferable changeling, a tyrant adolescent and troll out of Grimm.